Bus services to remote villages in rural parts of a Welsh county have been saved in a last-minute deal. But some of the areas in Carmarthenshire will still see their twice weekly return services cut to just one bus a week. Operator Morris Travel announced it was handing back its council contract on many routes from 19 January. Carmarthenshire council has now renegotiated the "very heavily subsidised" contract for 12 months. The decision to cancel the contract threatened bus services in the Tywi and Cothi valleys, including particularly around Llanarthne, Crugybar, Carmel, Llandeilo and Llandovery. 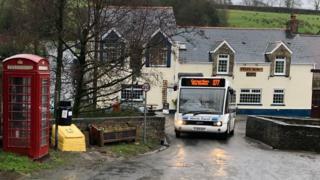 After the original announcement Councillor Cefin Campbell, Carmarthenshire's board member for rural affairs, described it as a problem for rural communities "because the bus routes are not as lucrative for bus companies". Council officials have now agreed a new tender with Morris Travel to "partially replace services". Public transport campaigner Hywel Jones described the deal as "lucky". "Otherwise we would have had no bus at all," he said. Mr Jones said the new deal would allow Morris Travel to cover most of the routes with just one bus and driver. He lives at Cwmdu which would still be left with a bus service on four days a week. But Monday services on routes 278 and 279 covering Llandeilo, along with the Saturday 277 service, will end. I actually live in Llanfynydd so jumped on the 09:50 GMT bus to become passenger number five on the 21-seater. It had already travelled on the back roads from Llandeilo. But a short distance on, the bus stopped right outside Julie Jones' front door to let her on as the sixth passenger. She was on her way to a hospital appointment in Carmarthen, but normally uses both the Wednesday and Saturday services for shopping in the town. She was sorry to lose her Saturday bus but resigned to the change. "It's not used as much as Wednesdays. Sometimes there's been just two other passengers coming back. But it will be a shame to lose it." Julie sat alongside Mildred Howells. A lot of the regular passengers have become friends over the years. They also know all the drivers. "It's Sean today, he's really good," said Mildred. Mildred lives just outside Llandeilo and was heading into Carmarthen with her shopping trolley, as she does twice a week. She will still be able to catch another bus on Saturdays - the 283 - but it runs through a number of villages and will take 90 minutes. "That's the scenic route," joked Julie. Mildred will be spending three hours on a bus for not much longer shopping in Carmarthen. Neither she nor Julie have ever driven: "It's almost impossible to live without a car round here." The bus turns off the main road onto a single track lane into the village of Felindre. The driver has to do a three-point turn in the small village. He picks up one more passenger, number seven. The 277 also diverts into Whitemill but no-one gets on. In future, this stop is being scrapped. But a third diversion near Abergwili picks up three more passengers, with a fourth in the village itself. Finally and almost into Carmarthen, the 277 is half-full. Virtually all though appeared to have used concessionary bus passes, with the bill being passed to the Welsh Government. "We have to use these buses more," said Mildred. Some routes will now be covered by the Bwcabus service which provides both fixed and bookable transport. Councillor Hazel Evans, executive board member for environment, said: "Whilst unfortunately some areas will have a reduced bus service, we have worked hard to rearrange routes so that no settlements are left without access to services at all." But the council emphasises that the new tender is for the next 12 months only and that passenger numbers will by monitored. "We urge residents of those communities which do not have access to other buses to continue to support these services to ensure their further continuation," said Ms Evans. The changes come into effect on Monday, 21 January.